Comm Eye Health Vol. 19 No. 60 2006 pp Community Eye Health J 2006;19(60): 64-65. Published online 01 December 2006. Directors, Maryknoll Blindness Prevention Project, 904 McKelligon Drive, El Paso, Texas, USA. 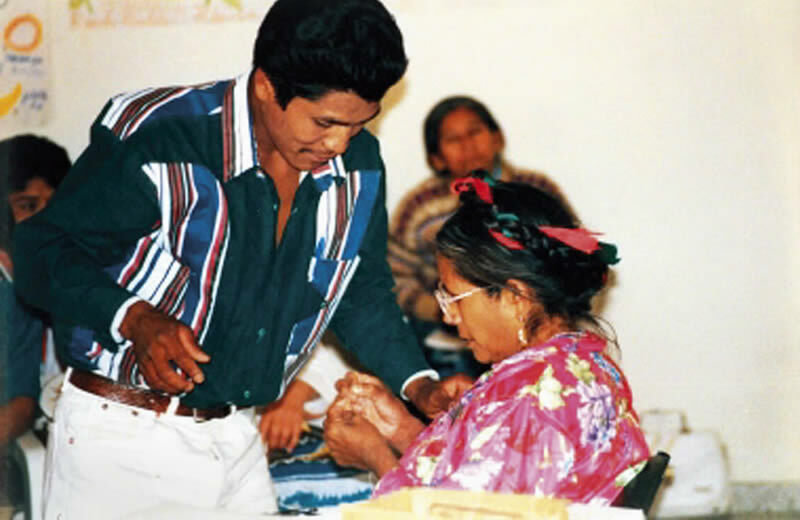 Programmes for blindness prevention in southern Mexico face multiple challenges. 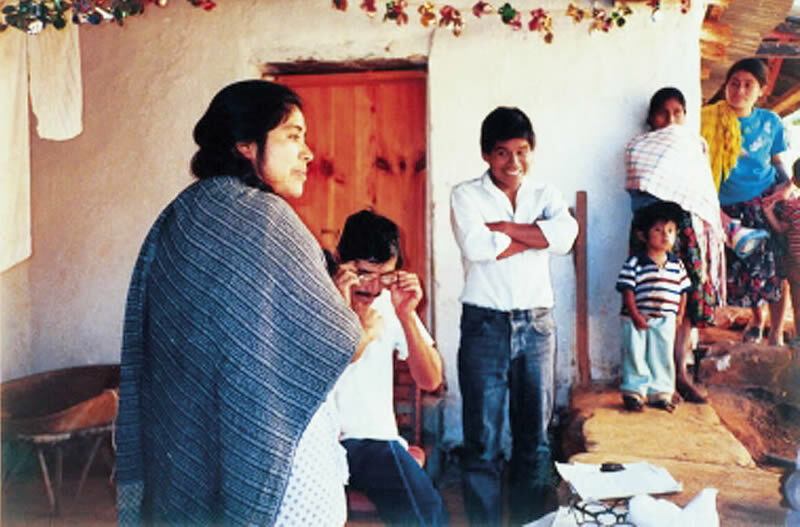 The people in greatest need live in remote rural villages. Mountain ranges and bad roads make access to these villages difficult. 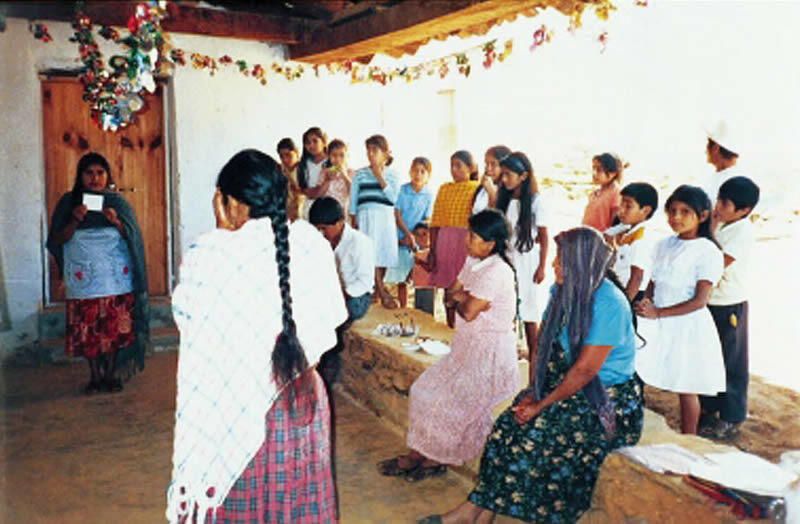 Multiple languages (16 distinct languages in the state of Oaxaca alone) along with a diversity of customs and beliefs, make effective communication challenging. It is impossible for an ophthalmologist acting alone to gain the access needed to serve these communities well. The government, churches, and NGOs are already involved in a wide variety of programmes to meet social needs in these communities. Workers who either live in the community or travel there on a regular basis are involved in initiatives such as nutrition programmes, basic health care, sanitation, and social work. They understand the local languages. They know regional customs and how to work with local authorities. These workers, equipped with the necessary knowledge and skills, are ideally positioned to deliver eye health services. Furthermore, government agencies, NGOs, and churches are pleased to have their workers acquire new skills and bring eye health services to the villages. Most often this is done on a part-time basis as workers ‘piggy-back’ eye services onto their other routines. In this way there is little or no additional expense. The newly trained workers are known as community eye health promoters (CEH promoters). To be enthusiastic partners in blindness prevention, and not merely functionaries, community eye health workers must understand what they are doing and why they are doing it. Since many workers have little or no experience in health care, and no formal education beyond primary school, we developed a workshop using language and concepts tailored to their level of experience and schooling. For instance, the terms ‘white part’ and ‘transparent part’ are used instead of conjunctiva and cornea. The visual pathway is reduced to six simple steps: light (forming an image) passes through the cornea, pupil, and lens and is captured by the retina; this image is transmitted by the optic nerve to the brain where vision occurs. Students achieve a rudimentary understanding of the anatomy and physiology of the visual system. CEH promoters learn to measure visual acuity using E charts in a programmed, standard routine. Standard-sized E characters to measure visual acuity are produced inexpensively in large quantities and mounted on stiff cardboard. Each promoter is equipped with E cards and a sixmeter- long cord; these items form a portable vision-testing kit which can be used easily with all ages and levels of literacy. The assessment is simple: vision must be 20/60 or better (20/40 for children). Lids must be clean, and able to open and close. The white part must be white. The transparent part must be transparent. The black part must be black. Once they have acquired a basic knowledge of structure and function, as well as hands-on experience with visual acuity measurement, CEH promoters quickly understand the possible causes of decreased vision. Slides and a model eye make the concepts more graphic. Promoters master the subject of cataract and can diagnose advanced cataract using two criteria: vision is equal to or lower than 20/200 and the pupil is white. They comprehend the risks of diabetes and glaucoma. Refractive errors make sense. The detection of problems is only the first step. The training also includes what to tell the patient. Using a list of questions frequently asked by patients and family, students participate in interactive classroom role-playing dramas in order to deepen their own understanding of problems and to prepare them to assist patients. CEH promoters are prepared to give a simple, clear explanation to patients about what their findings imply, answer questions, dispel myths and motivate patients to seek help when needed. Surveys reveal that ‘tired vision’, or uncorrected presbyopia, is a major preoccupation in rural communities. CEH promoters quickly learn criteria for diagnosing presbyopia. They practise determining the appropriate correction for patients by using a kit which contains lenses from +1.50 to +3.00 in half-dioptre steps, along with a needle and thread for illiterate patients and printed material for those who can read. The provision of spectacles for presbyopia brings patients, both women and men, willingly to the promoters, and gives their work credibility and authority. Patients, promoters, and participating organisations are extremely enthusiastic about this programme. The programme is self-sustaining. The bulk purchase of spectacles for presbyopia from a regional marketplace reduces costs. Spectacles can then be provided to patients at cost or cost-plus. Some programmes reward CEH promoters with a small stipend from the sales. 43 people were referred to the ophthalmologist. The diagnoses of the people referred was cataract (17 eyes), pterygium, referred when the pterygium is at the border of the pupil (6 eyes), refractive error and/or other disease (20 patients). Clearly, the promoters were able to address significant unmet needs. The challenge to reach those most in need of eye services in regions that are geographically remote and culturally diverse, can be met by persons who already live or work in these communities. With brief but appropriate training, they become enthusiastic partners in blindness prevention. Most CEH promoters ‘piggy-back’ this work onto their other routines so that eye care is integrated with other health and development issues. Providing spectacles for near vision, something that people need, and which enhances their lives, helps to build trust and confidence in other eye care services and greatly increases the effectiveness of blindness prevention programmes.